Jennifer M. Granholm was the Democratic Governor of Michigan from January 1, 2003 – January 1, 2011. She was succeeded by Republican Rick Snyder. Granholm was born in Vancouver, British Columbia, and is an honors graduate of both the University of California at Berkeley and Harvard Law School. She and her husband, Daniel G. Mulhern, have three children. On May 15, 2004, the Michigan Democratic Party held their annual Jefferson Jackson Day Dinner. At the dinner an iron sculpture representing equality, created by Wayne State University students was presented to the family of Millie Jeffrey. Jeffrey was a founder-leader of the Democratic Socialists of America. MDP Chair Melvin Hollowell stated that the Lifetime Achievement Award was given in tribute to "Millie's wonderful and enduring legacy of fighting for the equal rights of all people, particularly women." U.S. Senator Debbie Stabenow, U.S. Representative Carolyn Kilpatrick and Governor Jennifer Granholm presented the award. The keynote speaker was former U.S. House Minority Leader Richard Gephardt. In late 2008, Jennifer Granholm served on the Obama Economic Transition Team. Granholm was a strong advocate for federal aid to the automobile industry. Jennifer Granhom was elected governor of Michigan in 2002 and re-elected in 2006. She began her career in public service as a judicial clerk for Michigan's 6th Circuit Court of Appeals. She became a federal prosecutor in Detroit in 1990, and in 1994, she was appointed Wayne County Corporation Counsel. Granholm was elected Michigan's first female attorney general in 1998. Granholm serves as chair of the Health and Human Services Committee and is co-chair of the Health Care Task Force of the National Governors Association, and is chair of the Midwestern Governors Association. Gov. 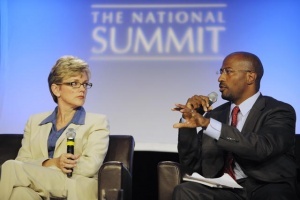 Jennifer Granholm took to the stage of the National Summit in Detroit in June 2009 predicting a green future for her state as a way to "replace a good chunk of those lost auto jobs." She repeated her oft-quoted statement that Michigan has "great bones" on which to build a green economy -- winds, waters, work force and work ethic, along with great research universities. She said Michigan's thousands of miles of freshwater coastlines are a natural home for wind power -- which for efficiency's sake should be built here too. Even Michigan's deep underground cave system, she said, heretofore used commercially only to store natural gas, could have a green future as a home for sequestered carbon dioxide. The final speaker in the open session was Van Jones, special advisor for green jobs, enterprise and innovation at the White House Council on Environmental Quality. Jones said the good news was that "despite all the challenges, the real economic pain, the real ecological concern, there is a solution that will put people back to work that respects what our scientists tell us about the planet cookin'." The bad news, he said, "is that you're it -- our business leaders and institutions. We will have to invent our way out of this crisis. We cannot drill and burn our way out of it, and we cannot bureaucratize our way out of it." In May 2010, former Obama "Green Jobs Czar" and long time Marxist activist Van Jones was keynote speaker at The Michigan Summit, an annual "progressive" conference held in East Lansing on June 12th. The Summit is where people "join with savvy policy wonks, leading lawmakers, student scholars, movement professionals and hard working activists in confronting Michigan's toughest challenges with solutions that work for Michigan's families and communities." In a promotional e-mail, the Granholm Leadership Fund (GLF) said, "Jones' message is vital to remaking our economy so we all share in the prosperity, not just the privileged few." The Michigan Summit is sponsored by both major Michigan teachers unions (AFT Michigan and the Michigan Education Association), Michigan National Organization for Women, Michigan Nurses Association, Planned Parenthood Affiliates of Michigan, and others. GLF is a political action committee started by the governor in 2003 that raises money for "state and local candidates and other activities that build the Michigan Democratic Party and help the governor invest in the people and the policies that put Michigan first." 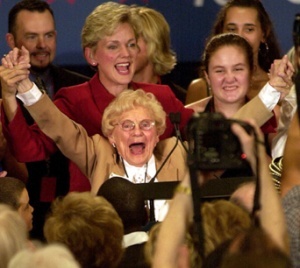 On Millie Jeffrey's death in March 2004, Michigan Governor Jennifer Granholm (described as Jeffrey's "protégé"), called her “our butterfly.” She was referring to the “butterfly effect”, a scientific theory which says that the smallest change in one part of the world can result in history-altering events someplace else. “She whipped up change in countless corners of our world and helped write entire chapters in the story of our nation and our state. She gave women across the globe – including me – a voice in politics and policy. And for an entire lifetime, she stood next to giants – Walter Reuther, Eleanor Roosevelt and Bobby Kennedy – and cast her own mighty shadow,” Granholm said. Democratic Socialists of America member Elizabeth Bunn was the creator of the UAW's Woman-to-Woman campaign that helped elect Senator Debbie Stabenow in 2000 and Governor Jennifer Granholm in 2002. Granholm was supported by EMILY's List during her campaigning. Thirteen years of fund-raising and five years of bricks-and-mortar work have doubled the size of the oldest mosque in Michigan. The $1.8 million expansion of the American Moslem Society was with a banquet celebrated Friday May 15 2009. Gov. Jennifer Granholm. U.S. Sen. Debbie Stabenow, D-Mich., Dearborn Mayor Michael Guido and other officials and dignitaries attended, joining Detroit-area Muslims who trace their roots to Yemen, Egypt, Morocco, Pakistan and other countries. Keynote speaker was Dr. Jamal Badawi. "Everyone is accepted, here," Mahdi Ali, president of the society, told The Detroit News for a Wednesday story. "Please tell people that even if you are not Muslim, please come here on any day. And if you are just curious about Islam, come and sit in the new library and read our books in Arabic and English and Spanish for Muslims and non-Muslims and watch some of our videos. 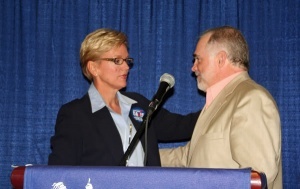 At the 2010 Michigan Democratic Party Convention on August 28, 2010, The Justice Caucus awarded Granholm the "Spirit of Millie Award" honoring her contribution to Michigan's judiciary via judicial appointments. Granholm also delivered a speech at the convention on the subject of "My vision of justice". 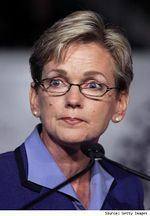 As at Feb. 1, 2011, Governor Jennifer Granholm was listed as an endorser and ongoing supporter of MichUHCAN's Health Care Security Campaign Coalition. The Michigan Universal Health Care Access Network is a state-wide network that promotes comprehensive health care for all and improved health outcomes by addressing the social determinants of health through education, strategy development and advocacy. The leadership of MichUHCAN is heavily dominated by members of Democratic Socialists of America. An energized resistance to ongoing attacks on education was on display at 2014's American Federation of Teachers national convention Los Angeles, July 11-14. Under the theme of "Reclaiming the Promise of Public Education," speakers and more than 3,500 delegates pledged to rebuff attacks by corporate forces on teachers, while also vowing to bring back equity in higher education for students and faculty. Political strategist Donna Brazile, self-described in her address as a "labor Democrat," teaches at Georgetown University and is presently organizing her fellow part-time faculty adjuncts into a union. Brazile described the recent Vergara v. California decision as "perverse," in its ruling that teacher tenure violates the civil rights of children. Social and economic inequality are the result of bad policies that have resulted in 22% of children living today under the federal poverty line, Brazile reported. "As a lifelong Democrat I am ashamed by attempts by some within in my own party ... who are trying to undermine public schools under the guise of reform," Brazile said. "Let me state this bluntly: the assault on public education is an assault on the principles of democracy and the foundation of our country." Brazile introduced Democrats for Public Education, a new organization to counter Democrats for Education Reform and other billionaire-funded organizations that pour money into charters and laws rolling back union protections. Former Gov. Ted Strickland of Ohio and former Gov. Jennifer Granholm of Michigan will be working in partnership with Brazile in the new organization. “It has been a pleasure working with the Council over the years to further our mutual understanding, and I look forward to continuing our progress in the years to come.” - former Michigan Gov. Jennifer M. Granholm (D) (March 2010). This page was last modified on 19 January 2018, at 01:48.